Do you know the landscape of Saudi Arabia? 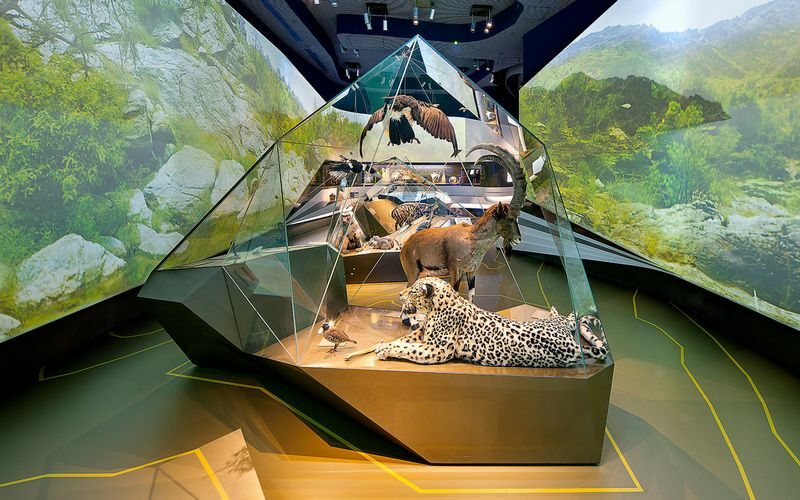 The Arabian Journeys exhibition in the King Abdulaziz Center for World Culture presents natural history and culture as a three-dimensional narrative experience so that visitors can immerse themselves in the diverse landscape spaces of the Arabian peninsula. ATELIER BRÜCKNER has staged the museum visit as a journey, which Ahmed und Tariq, two Arab guides, invite visitors to take part in; the uncle and nephew are presented in films throughout the exhibition. 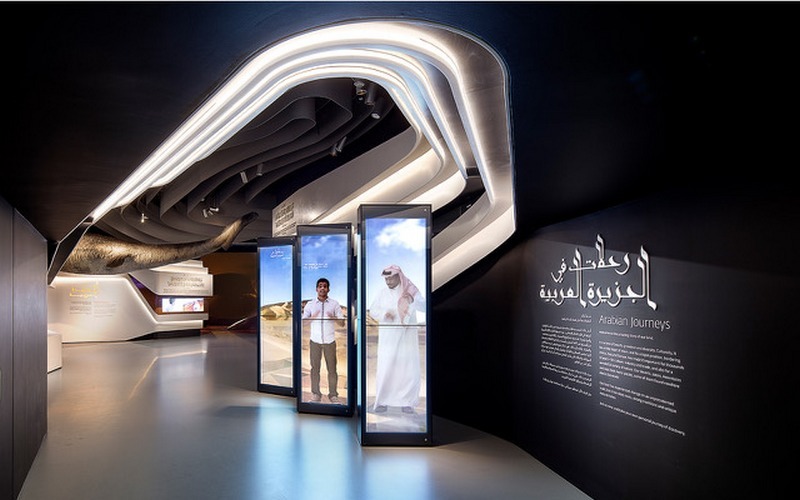 Accompanying the visitors, they explore the deserts, mountains and seas of Saudi Arabia, looking back at the prehistory of the Arabian peninsula and forward towards the challenges of the future. Visitors enter a clear, flowing spatial structure as an autonomous space within the gallery area, which is 1,300 square metre in size. Five ‘ribbons’ made of high-quality mineral material enclose and frame a variety of different spaces. Each ribbon represents a particular theme. It guides the visitor out of the central ‘connection zone’ and into the individually designed theme-based areas. Here, there is a film projection surface which completely surrounds the visitor and, in combination with light and sound, generates immersive experiences. Visitors become part of the landscape cycles portrayed by means of the films’ narratives. For example, they experience the inaccessible mountainous regions of the country during a helicopter flight or interact with shoals of fish from the Golf and the Red Sea. The underwater world of Saudi Arabia is shown as a responsive film collage. Whereas the ‘connection zone’ with its seating furniture and haptic books onto which moving digital information on the history of the country is projected is a place to dwell and to reflect on and return to, the stage-managed spaces offer emotional access to individual natural settings. Thematically dedicated texts and the dialogue of the guides, integrated in the respective thematic ribbon, put visitors in the right mood. Key exhibits guide the visitors out of the ‘connection zone’ and into the theme-based area. In the case of ‘Island Arabia’, for example, this is a mosasaur, an extinct marine reptile, which takes the visitors on a multi-sensory journey through 500 million years of Earth history. 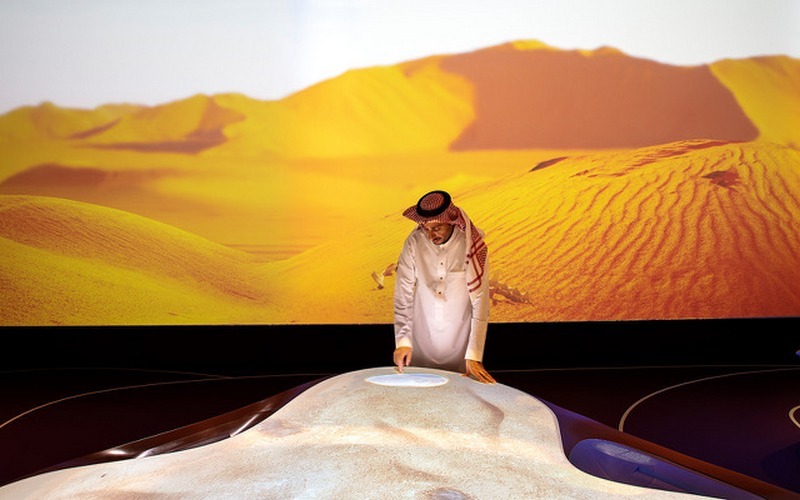 The film shown in the space is a visually stunning presentation of the geological development of the Arabian peninsula, summarised in a few minutes. It is coordinated with a media table that, using 11,000 dynamically moved rods, illustrates the faults caused by plate tectonics. A large-scale globe shows the shifting of the tectonic plates in time-lapse mode. 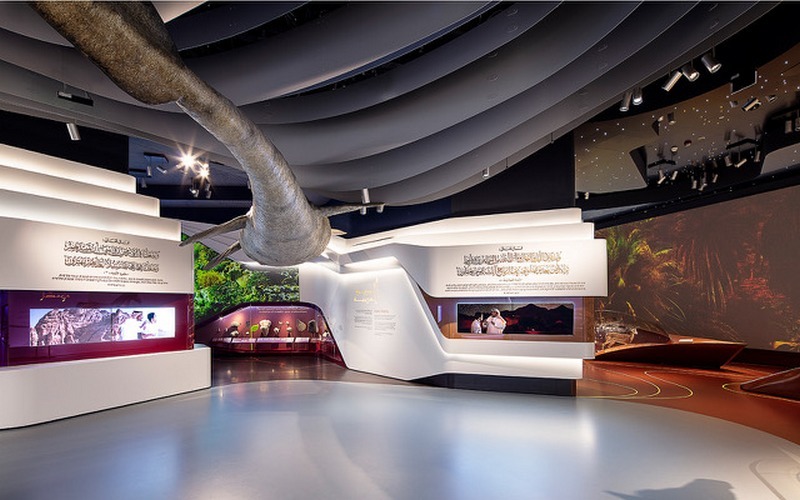 Each theme-based area has been designed individually in respect of the colours selected, the floor graphics and the implementation of the interactive media tables and showcases. They present the cultural specifics and fauna of the respective region. In the ‘Desert Trek’ area, the showcases adopt the flowing shape of dunes. In the ‘Coastal Voyage’ area, they are as transparent as water and, in the ‘Mountain Crossing’ area, their cubic, pointed peak-like design is reminiscent of the monolithic mountains of Saudi Arabia. With the help of augmented-reality tablets, it is possible to call up more detailed information on the exhibited items. 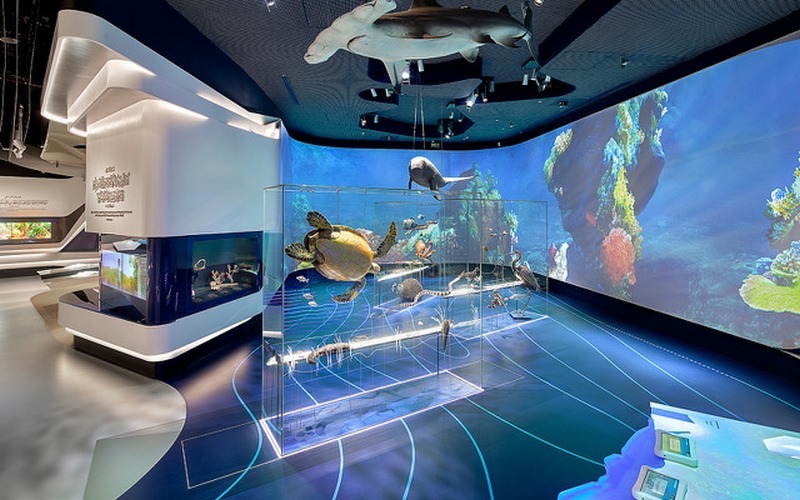 Visitors scan the animal models and then see wildcats, reptiles and sea dwellers in their natural environment. The interactive media tables of the theme-based areas encourage people in a playful manner to find out more about the individual landscape regions. 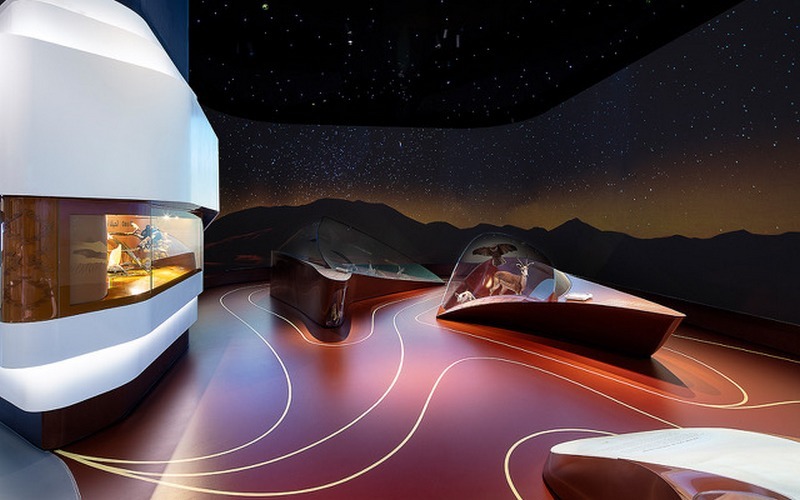 Here, visitors embark on individual journeys of discovery, follow a caravan through the desert or, with the help of a three-dimensional model of the mountains onto which images are projected, gain access to the impassable mountain regions of the country. In the framework of digital games, they solve specific problems. The ‘Into the Future’ area finally presents this edutainment approach as a holistic three-dimensional experience. The media table becomes the central exhibit, giving the narrative space its definitive character. In interaction with other visitors and the guides, who can be seen in the large-scale film that is projected all around, visitors take a look at the future of the country and at the challenges it is facing. For example, they can retrieve garbage from the sea and, in this way, find out about environment-protection projects and the necessary resource conservation. They also consider the topics of regenerative energy and pioneering urban planning. (Below image: INOCLAD Facades). 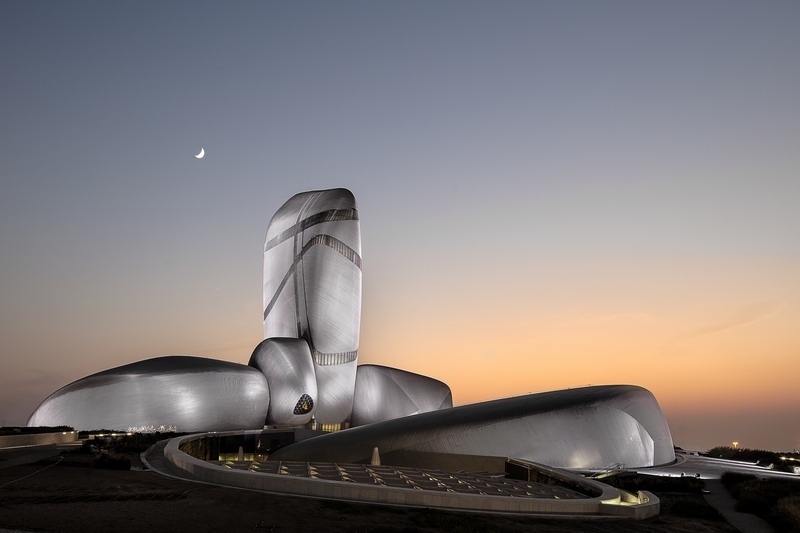 The King Abdulaziz Center for World Culture, which is also known under the name Ithra (‘cultural enrichment’), is one of the ‘world´s greatest places 2018’ according to Time Magazine. It was designed with the Norwegian architect’s office Snøhetta and incorporates several museum exhibitions, a huge library, a theatre and a cinema. 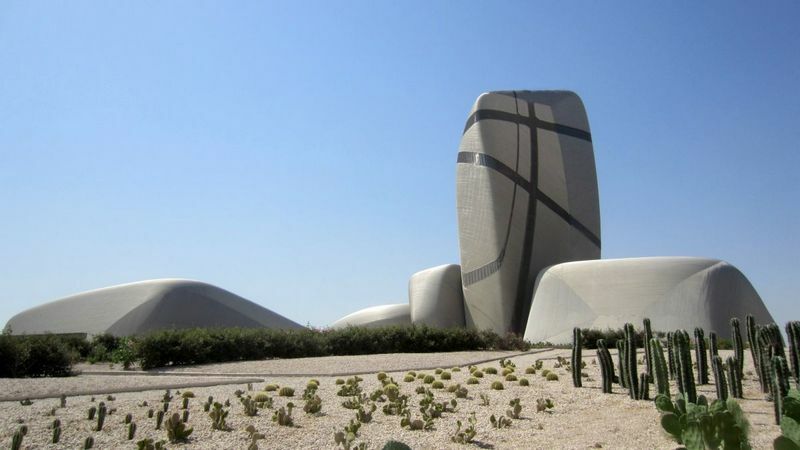 The client is the Saudi Aramco oil company, which financed this outstanding construction project, enabling a wide variety of cultural events and opportunities and making a magnificent gift to the population of Saudi Arabia. The event areas and galleries were opened successively – most of them in 2018. 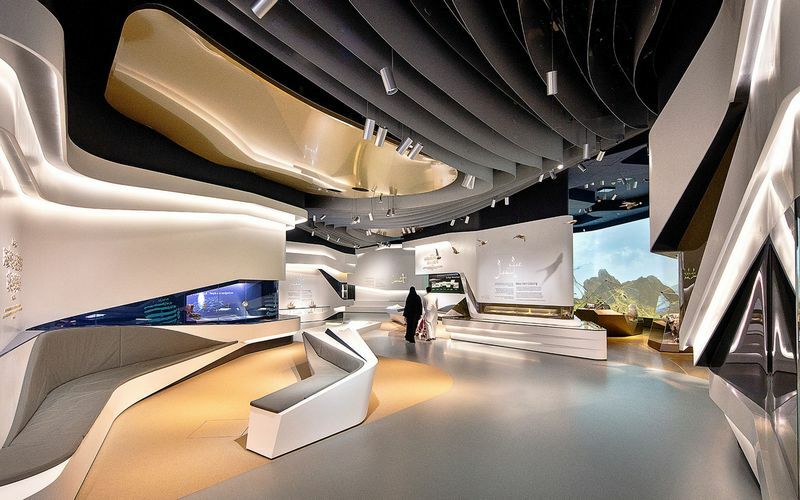 In the Ithra, ATELIER BRÜCKNER designed not only the ‘Arabian Journey’s exhibition but also the ‘Aramcorama’ and ‘Beauty and Identity’ galleries and the ‘IT Exhibits’ as well.